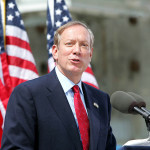 Prior to the rally, Pataki accuses President Obama of violating his oath of office — under the law Obama should have taken the agreement to Congress to allow them to review it before taking it to the United Nations Security Council. Congress has 60 days to review the agreement. That showed tremendous disrespect for the US Congress and it was an active betrayal of Israel, our strongest ally in the Middle East…In no way does this deal change Iran’s attitude to America. During the negotiations it was calling for ‘Death to America’. There are dozens of legitimate reasons to reject this deal. It allows for hundreds of billions in [sanctions] relief, the lifting of sanctions on conventional arms, all while Iran keeps supporting terror around the world. This isn’t a bad deal, it’s a God-awful deal, it must be rejected. Congress must do its job and stand up for the American people, stand up for our safety and say ‘no’ to this Iranian deal. Pataki says he will formally announce his candidacy in Exeter, N.H., the city the GOP claims is the birthplace of the Republican Party. It will be a very stiff climb up a very steep mountain, but that hasn’t stopped me in the past. Pataki airs a commercial in New Hampshire criticizing Republicans for attending too much to the social issues around them as opposed to dealing with economic and foreign policy problems. Defeating Islamic terrorists, shrinking government, growing the economy — these are the issues that matter most. These are the issues that matter most. Instead we’re debating social issues like abortion and gay rights. They are a distraction, and will only help elect Hillary. Pataki says he is concerned that President Obama is jeopardizing U.S. security. There is no question in my mind he is jeopardizing our security. You cannot turn terrorists loose, turn them back to where they came from, and not expect them to engage in that activity again. We’ve already seen the example of a number of Guantanamo detainees who were released and returned to the battlefield, fighting our troops, fighting others who are trying to uphold the rule of law and defend freedom. So that clearly places us in jeopardy.